Extra warranty can be handy - see if you can get 3 years worth of it as this is the usual lifespan of a notebook before it needs a refresh or you've broken it. How much data will the laptop hold? How much does your current one hold? Are you going to be saving all your photos and videos to it? RAM - system memory: more is better but 4GB of RAM is typically enough for most day to day computing activities. If you're a gamer, get more. Core i3, i5 and i7: these refer to the processor and it's type. i3 is aimed at general day to day work, i5 for harder work and maybe a bit of gaming and i7 for high end work and gaming. I prefer i3's for general office type work and find them to be fast enough for anything in a normal office environment, including most finance packages. For my general work in IT I have i5's everywhere - a solid compromise between cost and power without huge amounts of heat generation. And for my gaming rig, and my high end workstation running multiple virtual machines and doing heavy lifting (in a geeky way) I've got the big i7 on my desk. It takes a heap of power and was quite expensive. The Apple (Mac) environment is all locked up and proprietary. This is good and bad. Good because 99% of the time the software just works and the upgrade to new operating systems (like El Capitan) is free. Generally the upgrade is also pain free and just works. The bad news is, you're locked into the Apple way of doing things on your computer. There are ways to get around this - using Parallels or another virtualisation platform to run Windows and associated software, but this can be expensive in terms of cost for software (Parallels plus a Windows Licence) and expensive in terms of hardware utilisation. Generally though, the Macs on the market at the moment can well and truly handle it. The Mac will run Microsoft Office, or Apple have their own software - Pages / Numbers / Keynote. PCs typically will run Microsoft Windows and at the moment, they're all coming out with Windows 10. Love it or hate it - that's what you get. Lots of applications, lots of viruses and vulnerabilities. Without a fair bit of work you can't get Mac OS X to run on a PC. Generally you can get a fairly well specced PC for a lot less than a Mac. Finally, consider carefully what you'll use this computer for, then try to match the laptops you can get in your price range to those requirements. Most people will also look at which one is prettiest and which has the keyboard they prefer. These are important factors to consider so try to get eyes and hands on a machine before you buy. The Virtual Machines configuration 6ED5794F-DD19-46D3-8121-0880FEB592AE at 'D:\Hyper-V VM Data\VM NAME' is no longer accessible: General access denied error (0x80070005). With Event ID: 4096 and much sadness because your VMs won't boot? And did you move the folders that your VMs are living in to a new location but it should just work?! Well the chances are the security permissions on the files are wrong. I'm not talking about "Administrators" having all rights, but specific Virtual Machine rights. I recently upgraded my home server with a new array of disks - a jump from 500GB of storage to 2TB. It's a modest increase, but this is a hyper-v server, not a NAS. I copied off the VMs from the old disk to an external drive and then copied them back. Oh noes! Two of my virtual Linux servers declined to start again - bastards! So it was to the inter webs, and here, gentle reader, I hope you can find answers. If you check the permissions on the .xml configuration file for the VM you might see just the regular stuff on it. What you should also see is an entry for "NT VIRTUAL MACHINE\6ED5794F-DD19-46D3-8121-0880FEB592AE" there as well. Now in this instance the "6ED5794F-DD19-46D3-8121-0880FEB592AE" is specific to my virtual machine - you will have a different one. It's important to note that ID. You can get it from your .xml configuration file and various other places (I find the .xml to be the easiest). 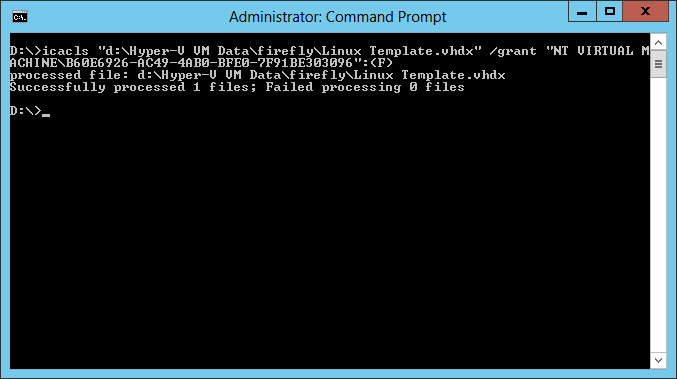 icicles "path to .vhd or .xml" /grant "NT VIRTUAL MACHINE\virtual machine ID":(F) and hit enter. You should have a return of"
processed file: "path to .vhd or .xml"
Do this for both the .vhdx (as in this case) and the .xml file. Once you go back to the Hyper-V management console, your VM should work. Otherwise, something else is b0rked and you'll need to chase it in Event Viewer! I hope this saves someone else the half an hour of Googling that I did this morning to sort it out. Best of luck!